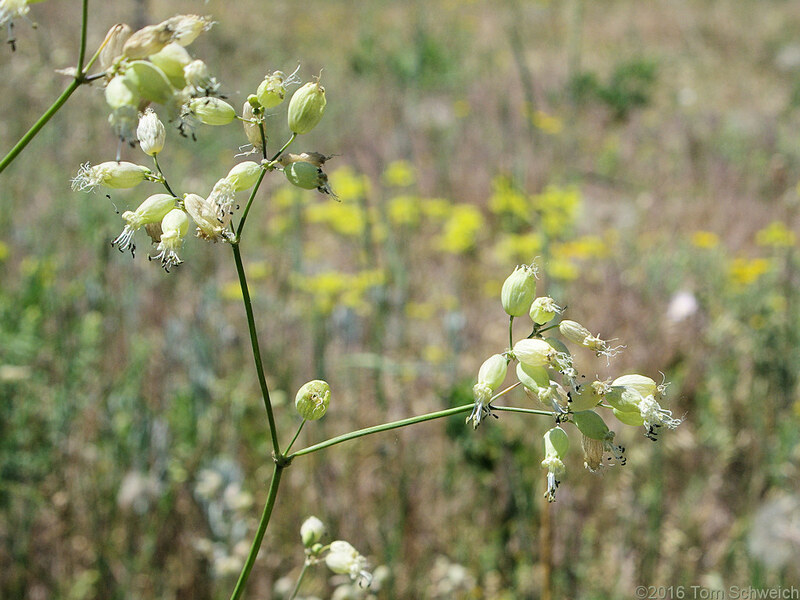 The field determination was Silene antirrhina, but now is changed to S. vulgaris. Coll. No. 1463, 27 June 2016, characters observed: Perennial herb, erect, to 55 cm., generally glabrous throughout; Stem, lacking dark sticky band, most, i.e., 7/8 stems, simple unbranched; Stipules, 0; Leaves, basal, unknown, cauline, opposite, 44 mm. × 6-7 mm. wide, sessile, bases connate; Calyx, tube 8 mm. × 5.5 mm. wide + lobes 2 mm. somewhat inflated, many green veins, not particularly prominent; indented around peduncle (when pressed and dry); Corolla, 13 mm., limb 6 mm., white; Stamens, #10, exserted; Filaments, white (definitely not purple); Seeds, 1 mm., brown, papillate. Field Notes: Coll. No. 1463, 27 Jun 2016. Other photos about Species or Caryophyllaceae Silene vulgaris.